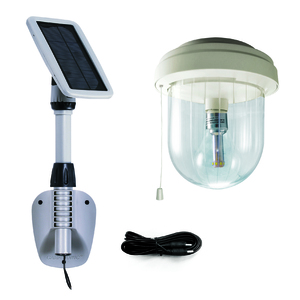 The Solar Shed Light with new solar bulb technology creates a low cost, energy efficient way to illuminate your sheds, garages and outdoor enclosed spaces. Equipped with one of our new patented GS Solar Light Bulbs, and durable weather-resistant, rustproof construction. Now add the perfect touch to any outdoor construction. Expansion secondary light sold separately. • New Solar Technology: The GS Solar Light Bulb is Brand New Patent Pending Technology that takes the conventional idea of a light bulb and incorporates it into outdoor solar applications. • No maintenance is required: Constructed of weather-resistant, rustproof rigid resin. • Cool White Light: Illuminates at 250 lumens in a bright white (6000K) color temperature. Outputs 500 total lumens with expansion fixture! • Operation: Features up to 4 hours of constant run time with 1 Light fixture and up to 2 hours of constant run time with expanded double Light fixture! • Built to Last: Our goal is to build the world�s best solar lights by providing long lasting light fixtures that are simply built to last! Features integrated 4.8V 2000 mAh NI-HM battery pack. Once the battery exceeds its life � all you will need to do is simply replace the battery and you are good to go for the next 1-3 years. • WARNING: GAMA SONIC� Light bulbs are not to be used in other electrical sockets. These are low-voltage light bulbs that are built and designed for our products only! Dimensions: 19.7" x 6.8" x 13"
The included Solar PV cable is 16 Feet. Thank you for your inquiry!